Frick 'n Frack were recued on the side of the road by three compassionate women. During a late fall visit to our Program Partner located in St. Johns, AZ, Good Dog Rez-Q, we met several recent rescues who were waiting for their forever homes. 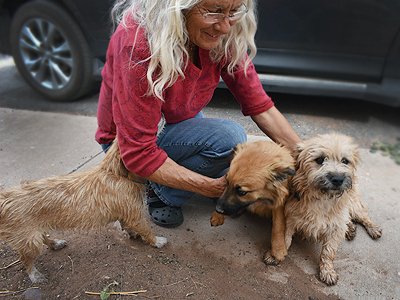 The rescue organization’s owner, Tamara Martin, laughingly commented, “I call them Frick ‘n Frack and Andy ‘n Annie.” She said they were found in Leupp, AZ, a Navajo community located about two hours northwest of Tamara’s rescue operation. 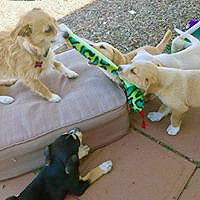 These abandoned puppies were rescued in October by three compassionate women on the side of the road. Charlie welcomes the new rescues and even helps train them! Once they arrived at St. Johns, the two pups enjoyed their big yard with a wading pool, covered porch to keep them from the scorching sun, and two doghouses for shelter from the weather. They have been on off-leash walks with their rescue pack and they both acted respectfully. Tamara shared that walking was a good way to observe temperaments of the foster pups as they interacted with their extended family and foster “aunts and uncles.” Tamara didn’t know if they were related, but they were very close in age. Once altered, they would be ready for their forever homes. Charlie, another rescue, was about a year and half old. He welcomed the new rescues and even provided some training to the newbies in dealing with snakes. Also just a pup when he came to Good Dog Rez-Q, Charlie still hoped to graduate to his own forever home. Wolfie has found his forever home with Tamara and her husband. Tamara shared that there are some rescues, through no fault of their own, had already found their forever home with Tamara and her husband. Wolfie was one of these unadoptable seniors that also suffered from high medical needs. 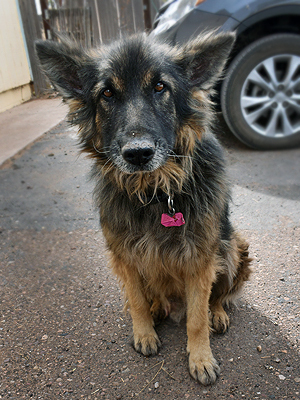 A 10-year-old shepherd mix when he was pulled from an out-of-state rescue, he was days from being euthanized. The rescue team familiar with Tamara knew there were placements that she alone would take on. Wolfie was one of these. He came to Good Dog Rez-Q with a fungal infection and his ears full of fluid, among other skin conditions. Now 11-years-old, he still received regular medication and steroid shots. He was clearly at home with his new family — two- and four-legged alike. The Reservation Animal Rescue™ (RAR) program is honored to work with Program Partners like Tamara. All are dedicated in making sure that each animal finding their way to Good Dog Rez-Q is given compassion, love, and dignity in their remaining years.